Ready to go back almost 5000 years in time? That's right! 5000 years ago a farmer settled with his family close to what is now the city of Speyer. Now with a population of about 50000 Speyer started its glory once Emperor Augustus wanted to expand the Roman Empire and lead his troops to built the first fort in 50 B.C. Lots of evidence of this and older periods can be found around town. One of the most renowned finds of around 1500 B.C. is the "Golden Hat of Schifferstadt", a bronze age artifact made of thin sheet gold and served as the external decoration of a head-dress, probably of an organic material, with a brim and a chin strap. You can find this and many more historical finds in the Historical Museum of Speyer. 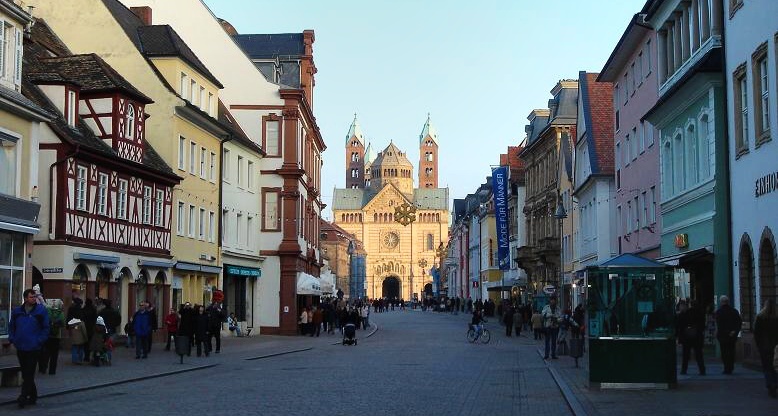 Speyer was also a Bishop's seat which was first given away in the year 346. The laying of the foundation stone for the new cathedral also give the decisive impulse for the further development of the town. In the year 1061 the cathedral is consecrated and finally completed in 1111. It is a building which dwarfs all other Romanesque churches in Germany in its size and significance, symbolizing Imperial rule and Christianity with the burial place for eight! German Emperors and Kings and four Queens. A large number of events, decisions and meetings underpin Speyer's role in the history of medieval Europe: Henry IV's departure for Canossa in 1077, the preaching of Bernard of Clariyaux and the beginning of the second crusade at Christmas 1141, the handing-over of Richard the Lionheart to Henry IV in 1193 or Friedrich II's first journey through Germany in the year 1213. In 1294 the bishop's rule ends and Speyer becomes an imperial free town with its own government and administration. Clear, external evidence of this political and economic importance in the empire is the Old Town Gateway from this period, one of the few remains of the town's fortifications. 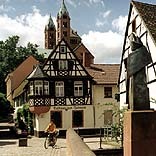 At the same time as these great historical events the first Jewish community emerges on the edge of the bishops' town, under the special protection of Emperor Henry IV and which, in spite of pogroms and persecution has helped influence the spiritual life of Speyer throughout the ages. Witness of the Jewish culture and everyday life is seen in the remains of the synagogue and Jewish bathhouse as well as in the Historical Muserum of the Palatinate, as mentioned above. After you are done with sightseeing you might be interested in some culinary delights. "In Speyer, the Palatinate begins to turn into Italy", that's what the locals proudly say when asked about the culinary pleasures awaiting the visitor. Hundred of outdoor seats front the ice cream parlors (serving home made Italian ice, a must try), taverns and bistros that are arranged like a string of pearls extending from the cathedral to the old city gate. Even "Father Rhine", as locals affectionately call the river that borders Speyer, gets incorporated into several of these establishments. The tempting aroma of delicious specialties hangs in the air, especially when Summer Folk Festivals turn Speyer's streets and squares into a giant open air celebration.